Homogeneous charge compression ignition (HCCI)/controlled auto-ignition (CAI) has emerged as one of the most promising engine technologies with the potential to combine fuel efficiency and improved emissions performance, offering reduced nitrous oxides and particulate matter alongside efficiency comparable with modern diesel engines. Despite the considerable advantages, its operational range is rather limited and controlling the combustion (timing of ignition and rate of energy release) is still an area of on-going research. Commercial applications are, however, close to reality. HCCI and CAI engines for the automotive industry presents the state-of-the-art in research and development on an international basis, as a one-stop reference work. The background to the development of HCCI / CAI engine technology is described. 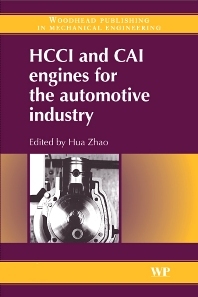 Basic principles, the technologies and their potential applications, strengths and weaknesses, as well as likely future trends and sources of further information are reviewed in the areas of gasoline HCCI / CAI engines; diesel HCCI engines; HCCI / CAI engines with alternative fuels; and advanced modelling and experimental techniques. The book provides an invaluable source of information for scientific researchers, R&D engineers and managers in the automotive engineering industry worldwide. Part 1 Overview: Motivation, definition, and history of HCCI/CAI engines. Part 2 Gasoline HCCI/CAI combustion engines: Overview of CAI/HCCI gasoline engines; Two-stroke CAI engines; Four-stroke gasoline HCCI engines with thermal management; Four-stroke CAI engines with residual gas trapping; Four-stroke CAI engines with internal exhaust gas recirculation (EGR); HCCI control; CAI control and CAI/SI switching; Fuel effects in CAI gasoline engines. Part 3 Diesel HCCI combustion engines: Overview of HCCI diesel engines; HCCI combustion with early and multiple injection in the heavy-duty diesel engine; Narrow angle direct injection (NADITM) concept for HCCI diesel combustion; Low-temperature and premixed combustion concept with late injection; HCCI fuel requirements. Part 4 HCCI/CAI combustion engines with alternative fuels: Natural gas HCCI engines; HCCI engines with other fuels. Part 5 Advances modeling and experimental techniques: Auto-ignition and chemical kinetic mechanisms of HCCI combustion; Overview of modeling techniques and their application to HCCI/CAI engines; Overview of advanced optical techniques and their applications to HCCI/CAI engines. Part 6 Future directions for CAI/HCCI engines: Outlook and future directions in HCCI/CAI engines. Professor Hua Zhao leads a large research group on IC engines and their fuels at Brunel University West London. He has over 20 years’ research experience in combustion engines and combustion flows. His research covers both gasoline and diesel engines and their fuels, with particular emphasis on advanced combustion processes and engine cycles. He has published over 150 papers and authored a comprehensive book on engine combustion instrumentation and diagnostics.